Our customer’s office is located on a very busy crossing with plenty of passing traffic. One of the best ways to advertise your business on the High St, and make sure potential customers know you are there, is to have illuminated and/ or moving displays. The LED light pockets are ideal for illuminated poster and property displays, and advertise to customers that you are open for business, and professional in your approach. 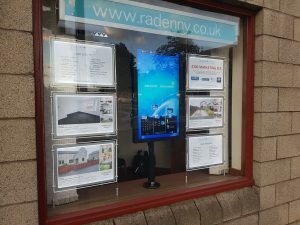 Including a digital display also increases attraction to your windows simply using movement, which studies have shown dramatically increases footfall into retail premises. Using a dynamic digital high brightness screen like this, allows the customers to advertise and market their other services to traffic waiting at the busy crossing, while increasing awareness of their business dramatically. As discussed in our previous project reports, it is important to use one of our high brightness screens to get the best results in windows. 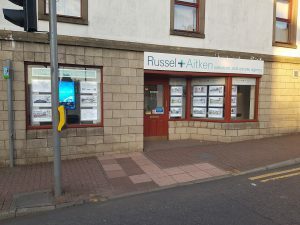 As these pictures show, especially the one below taken from across the road on a bright sunny afternoon, these displays are not just beneficial at night, but even in daylight, they bring the customer’s window display to life, due to the high brightness digital screen, and the bright LED light pockets. Of course, the windows look even more dynamic and attractive at night, and we have yet another delighted customer. More pictures to follow.